Hiasa Y., Otake Y., Tanaka R., Sanada S., Sato Y. Recovery of 3D rib motion from dynamic chest radiography and CT data using local contrast normalization and articular motion model. Medical image analysis, 51, 144-156. • 3D rib motion was automatically recovered from x-ray video and one time-phase CT.
• Local contrast normalization improved the cost function space facilitating robustness in the optimization. • An articular motion model of the rib constrained the optimization to obtain physically plausible rib motion. • The improved accuracy was demonstrated in both simulation and real-image experiments. • Correlation between improvement of the cost function space and robustness was analyzed by real-image experiments. 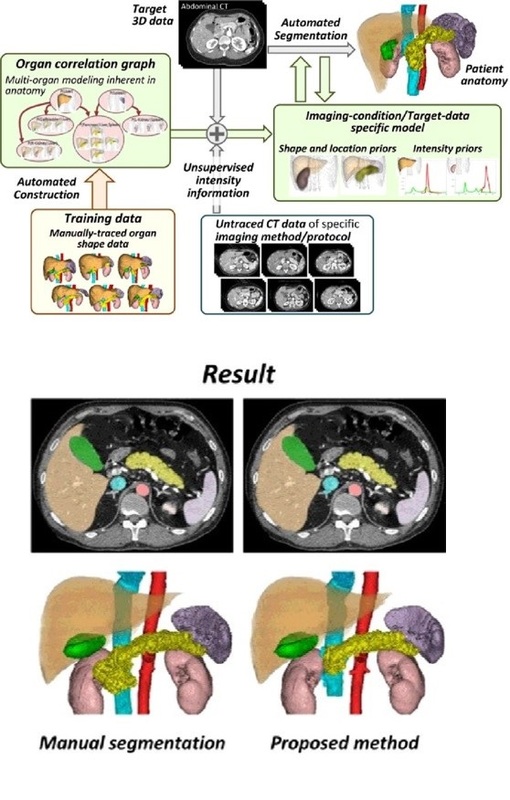 Okada T, Linguraru MG, Hori M, Summers RM, Tomiyama N, Sato Y.
Abdominal multi-organ segmentation from CT images using conditional shape–location and unsupervised intensity priors. Medical image analysis. 2015 Dec 31;26(1):1-8. • Multiple abdominal organs were automatically segmented from CT images. • A method for modeling prediction-based conditional shape-location priors is developed. • Organ correlation graph is introduced, which embeds the spatial correlations among organs. • Proposed priors enables the estimation of intensity priors from unsupervised intensity information. • The results were comparable to state-of-the-art methods using supervised intensity information. 2009 Okada et al. Biomedical Engineering, IEEE Transactions on T. Okada, Y. Iwasaki, T. Koyama, N. Sugano, Y.-W. Chen, K. Yonenobu, and Y. Sato, “Computer-assisted preoperative planning for reduction of proximal femoral fracture using 3-D-CT data,” Biomedical Engineering, IEEE Transactions on, vol. 56, no. 3, pp. 749-759, 2009. 2009 Kurazume et al. Computer Vision and Image Understanding R. Kurazume, K. Nakamura, T. Okada, Y. Sato, N. Sugano, T. Koyama, Y. Iwashita, and T. Hasegawa, “3D reconstruction of a femoral shape using a parametric model and two 2D fluoroscopic images,” Computer Vision and Image Understanding, vol. 113, no. 2, pp. 202-211, 2009. 2008 Okada et al. Academic Radiology T. Okada, R. Shimada, M. Hori, M. Nakamoto, Y.-W. Chen, H. Nakamura, and Y. Sato, “Automated segmentation of the liver from 3D CT images using probabilistic atlas and multilevel statistical shape model,” Academic Radiology, vol. 15, no. 11, pp. 1390-1403, 2008. 2008 Nakamoto et al. Medical Imaging, IEEE Transactions on M. Nakamoto, K. Nakada, Y. Sato, K. Konishi, M. Hashizume, and S. Tamura, “Intraoperative magnetic tracker calibration using a magneto-optic hybrid tracker for 3-D ultrasound-based navigation in laparoscopic surgery,” Medical Imaging, IEEE Transactions on, vol. 27, no. 2, pp. 255-270, 2008. 2007 Sugano et al. Journal of Bone & Joint Surgery, British Volume N. Sugano, T. Nishii, H. Miki, H. Yoshikawa, Y. Sato, and S. Tamura, “Mid-term results of cementless total hip replacement using a ceramic-on-ceramic bearing with and without computer navigation,” Journal of Bone & Joint Surgery, British Volume, vol. 89, no. 4, pp. 455-460, 2007. 2007 Otake et al. Computer Aided Surgery Y. Otake, N. Suzuki, A. Hattori, H. Miki, M. Yamamura, K. Yonenobu, T. Ochi, and N. Sugano, “System for intraoperative evaluation of soft-tissue-generated forces during total hip arthroplasty by measurement of the pressure distribution in artificial joints,” Computer Aided Surgery, vol. 12, no. 1, pp. 53-59, 2007. 2007 Nakamoto et al. Medical image analysis M. Nakamoto, H. Hirayama, Y. Sato, K. Konishi, Y. Kakeji, M. Hashizume, and S. Tamura, “Recovery of respiratory motion and deformation of the liver using laparoscopic freehand 3D ultrasound system,” Medical image analysis, vol. 11, no. 5, pp. 429-442, 2007. 2005 Otake et al. Journal of biomechanics Y. Otake, N. Suzuki, A. Hattori, K. Hagio, N. Sugano, K. Yonenobu, and T. Ochi, “Four-dimensional model of the lower extremity after total hip arthroplasty,” Journal of biomechanics, vol. 38, no. 12, pp. 2397-2405, 2005. 2004 Yamaguchi et al. Computer Aided Surgery T. Yamaguchi, M. Nakamoto, Y. Sato, K. Konishi, M. Hashizume, N. Sugano, H. Yoshikawa, and S. Tamura, “Development of a camera model and calibration procedure for oblique-viewing endoscopes,” Computer Aided Surgery, vol. 9, no. 5, pp. 203-214, 2004. 2004 Nishii et al. Osteoarthritis and cartilage T. Nishii, N. Sugano, Y. Sato, H. Tanaka, H. Miki, and H. Yoshikawa, “Three-dimensional distribution of acetabular cartilage thickness in patients with hip dysplasia: a fully automated computational analysis of MR imaging,” Osteoarthritis and cartilage, vol. 12, no. 8, pp. 650-657, 2004. 2004 Kawasaki et al. Information Technology in Biomedicine, IEEE Transactions on Y. Kawasaki, F. Ino, Y. Mizutani, N. Fujimoto, T. Sasama, Y. Sato, N. Sugano, S. Tamura, and K. Hagihara, “High-performance computing service over the Internet for intraoperative image processing,” Information Technology in Biomedicine, IEEE Transactions on, vol. 8, no. 1, pp. 36-46, 2004. 2003 Zoroofi et al. Information Technology in Biomedicine, IEEE Transactions on R. A. Zoroofi, Y. Sato, T. Sasama, T. Nishii, N. Sugano, K. Yonenobu, H. Yoshikawa, T. Ochi, and S. Tamura, “Automated segmentation of acetabulum and femoral head from 3-D CT images,” Information Technology in Biomedicine, IEEE Transactions on, vol. 7, no. 4, pp. 329-343, 2003. 2003 Sato et al. Medical Imaging, IEEE Transactions on Y. Sato, H. Tanaka, T. Nishii, K. Nakanishi, N. Sugano, T. Kubota, H. Nakamura, H. Yoshikawa, T. Ochi, and S. Tamura, “Limits on the accuracy of 3-D thickness measurement in magnetic resonance images-effects of voxel anisotropy,” Medical Imaging, IEEE Transactions on, vol. 22, no. 9, pp. 1076-1088, 2003. 2003 Masumoto et al. Medical image analysis J. Masumoto, Y. Sato, M. Hori, T. Murakami, T. Johkoh, H. Nakamura, and S. Tamura, “A similarity measure for nonrigid volume registration using known joint distribution of targeted tissue: application to dynamic CT data of the liver,” Medical image analysis, vol. 7, no. 4, pp. 553-564, 2003. 2002 Moriyama et al. 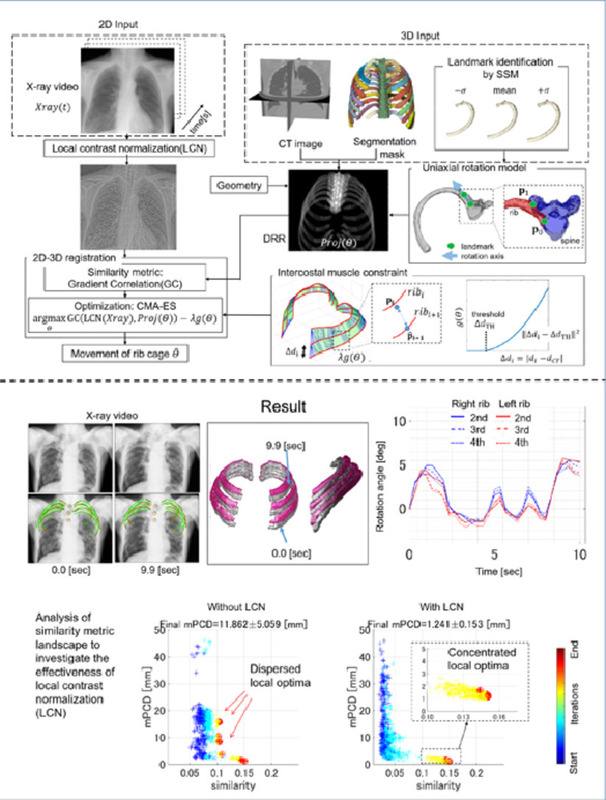 Medical Imaging, IEEE Transactions on M. Moriyama, Y. Sato, H. Naito, M. Hanayama, T. Ueguchi, T. Harada, F. Yoshimoto, and S. Tamura, “Reconstruction of time-varying 3-D left-ventricular shape from multiview X-ray cineangiocardiograms,” Medical Imaging, IEEE Transactions on, vol. 21, no. 7, pp. 773-785, 2002. 2001 Sugano et al. Computer Aided Surgery N. Sugano, T. Sasama, Y. Sato, Y. Nakajima, T. Nishii, K. Yonenobu, S. Tamura, and T. Ochi, “Accuracy evaluation of surface‐based registration methods in a computer navigation system for hip surgery performed through a posterolateral approach,” Computer Aided Surgery, vol. 6, no. 4, pp. 195-203, 2001. 2000 Sato et al. Visualization and Computer Graphics, IEEE Transactions on Y. Sato, C.-F. Westin, A. Bhalerao, S. Nakajima, N. Shiraga, S. Tamura, and R. Kikinis, “Tissue classification based on 3D local intensity structures for volume rendering,” Visualization and Computer Graphics, IEEE Transactions on, vol. 6, no. 2, pp. 160-180, 2000. 2000 Chen et al. Pattern Analysis and Machine Intelligence, IEEE Transactions on J. Chen, Y. Sato, and S. Tamura, “Orientation space filtering for multiple orientation line segmentation,” Pattern Analysis and Machine Intelligence, IEEE Transactions on, vol. 22, no. 5, pp. 417-429, 2000. 1998 Sato et al. Journal of computer assisted tomography Y. Sato, N. Shiraga, S. Nakajima, S. Tamura, and R. Kikinis, “Local Maximum Intensity Projection (LMIP: A New Rendering Method for Vascular Visualization,” Journal of computer assisted tomography, vol. 22, no. 6, pp. 912-917, 1998. 1998 Sato et al. Medical Imaging, IEEE Transactions on Y. Sato, M. Nakamoto, Y. Tamaki, T. Sasama, I. Sakita, Y. Nakajima, M. Monden, and S. Tamura, “Image guidance of breast cancer surgery using 3-D ultrasound images and augmented reality visualization,” Medical Imaging, IEEE Transactions on, vol. 17, no. 5, pp. 681-693, 1998. 1998 Sato et al. Medical image analysis Y. Sato, S. Nakajima, N. Shiraga, H. Atsumi, S. Yoshida, T. Koller, G. Gerig, and R. Kikinis, “Three-dimensional multi-scale line filter for segmentation and visualization of curvilinear structures in medical images,” Medical image analysis, vol. 2, no. 2, pp. 143-168, 1998. 1998 Sato et al. Medical Imaging, IEEE Transactions on Y. Sato, T. Araki, M. Hanayama, H. Naito, and S. Tamura, “A viewpoint determination system for stenosis diagnosis and quantification in coronary angiographic image acquisition,” Medical Imaging, IEEE Transactions on, vol. 17, no. 1, pp. 121-137, 1998. 1997 Sato et al. Pattern Analysis and Machine Intelligence, IEEE Transactions on Y. Sato, M. Moriyama, M. Hanayama, H. Naito, and S. Tamura, “Acquiring 3D models of non-rigid moving objects from time and viewpoint varying image sequences: A step toward left ventricle recovery,” Pattern Analysis and Machine Intelligence, IEEE Transactions on, vol. 19, no. 3, pp. 253-259, 1997. 1997 Sato et al. Biomedical Engineering, IEEE Transactions on Y. Sato, J. Chen, R. A. Zoroofi, N. Harada, S. Tamura, and T. Shiga, “Automatic extraction and measurement of leukocyte motion in microvessels using spatiotemporal image analysis,” Biomedical Engineering, IEEE Transactions on, vol. 44, no. 4, pp. 225-236, 1997. 1996 Zoroofi et al. Medical Imaging, IEEE Transactions on R. A. Zoroofi, Y. Sato, S. Tamura, and H. Naito, “MRI artifact cancellation due to rigid motion in the imaging plane,” Medical Imaging, IEEE Transactions on, vol. 15, no. 6, pp. 768-784, 1996. 1995 Zoroofi et al. Medical Imaging, IEEE Transactions on R. A. Zoroofi, Y. Sato, S. Tamura, H. Naito, and L. Tang, “An improved method for MRI artifact correction due to translational motion in the imaging plane,” Medical Imaging, IEEE Transactions on, vol. 14, no. 3, pp. 471-479, 1995.